One of the things it’s well worth knowing (and the one your boss will likely get fixated on) is the products your company sells. One of the things bosses do to help you learn all the details of the company’s products is they arrange for you to read through all the literature they have then if you are lucky you get to hang out with people that own the products, like product managers, and they get to hit you lots of detailed features of the products. Once you’re thoroughly confused, they tell you to get out there and sell and that you’ve already used up a couple of weeks of selling time. Tick, tock! Thankfully for all of us Jill Konrath wrote a whole book about how sales people can quickly learn what they need to know. The book is called Agile Selling and you should read it if you’d like more than one blog post of information on the topic. In her book Jill gives a six-point framework for learning information quickly. Due to my own failings, I have found I could not learn six points and so I’ve cut them down to three. I can remember three points and I’m hoping you will be able to too. Science tells us the brain remembers information better when it’s written down. So write down notes when your hanging with your company’s product experts and reading the bountiful literature. Don’t worry too much about how to organize your notes. That’s next. Just be sure you can read your own writing and understand it. 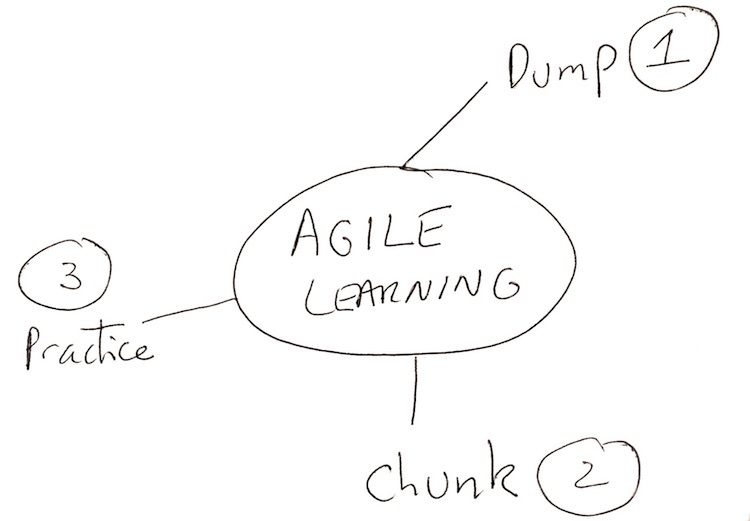 To be able to remember all this dumped data you need to organize it into “chunks”. The best way I have found to do this is to draw a mind map, like the wonderful drawing above in this post. Mind maps are simply topics with circles around the topic name and then all the subtopics of that topic connected to the main topic by lines. It turns out your brain likes to organize and remember things this way. Take all the data that you dumped in your notes and figure out some categories the information could belong to. Map out these categories on a mind map and connect the important points in your notes to these category “circles”. Check out Tony Buzan‘s website to learn more about how to draw mind maps. Not rocket science to anyone that has been alive much but you retain stuff when you use it. So you need to start using this product knowledge as soon as you can. Send some emails to friends and family describing the features and benefits of your products. This way if/when you totally screw up, you don’t lose a live sales opportunity or get fired right away by a frustrated boss. Do some role playing if you can find anyone to listen to you. The best way to learn is to teach. Try to train someone on your products…even if it’s your mother-in-law. You will learn a lot and she may learn something too. Learning your products is a good idea before you start selling them. Learn quickly. Get out there and do your best with what you’ve learned, adjust and then learn some more. Be agile my friends.